View the newest photos on Mealtrip. Peruse a random photo-fall page and catch some foodie inspiration. All of our news and articles listed from the most recent to the oldest. We'll attempt to answer a few questions that you might have about Mealtrip.com. Click this "Report" link directly on the page where you've found an error. Here's a list of the featured contributors at Mealtrip.com. Here's a current list of all the pages on the Mealtrip.com site. Fresh Baked Photos - View the newest photos on Mealtrip. Inspiration Falls - Peruse a random photo-fall page and catch some foodie inspiration. News & Editorial Articles - All of our news and articles listed from the most recent to the oldest. 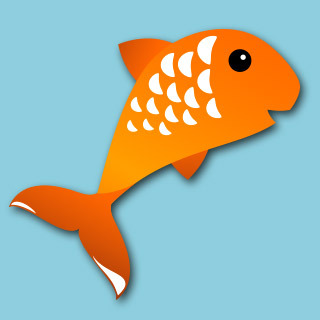 FAQ - We'll attempt to answer a few questions that you might have about Mealtrip.com. Report - Click this "Report" link directly on the page where you've found an error. Site Map - Here's a current list of all the pages at Mealtrip.com. Thank You! ... You can quick vote for this location again in 30 days. 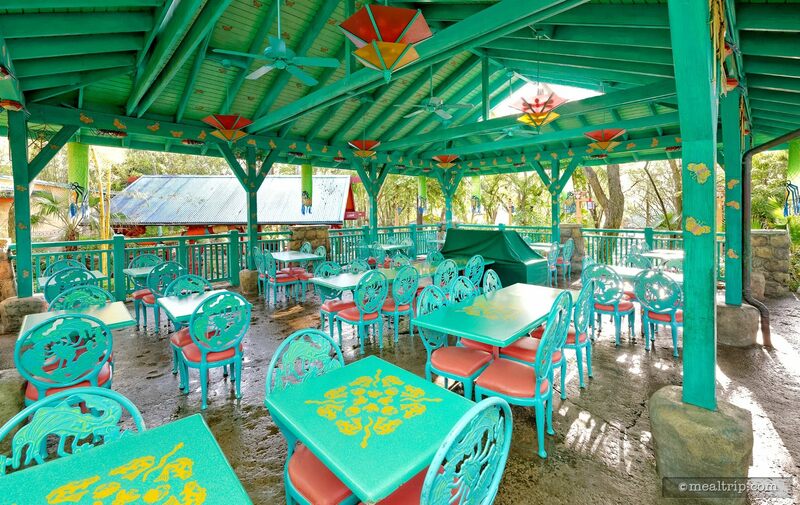 Seating at the Flame Tree Barbecue is half covered and half uncovered... but all outdoors. Depending on the time of year, this can be very pleasant, or very warm. There are great views of the Expedition Everest attraction from just about every seat, and a relaxing reflection pool in the center of the dining area. Which attracts birds... birds that love Barbecue. The Barbecue here is a bit different than at other Disney locations. 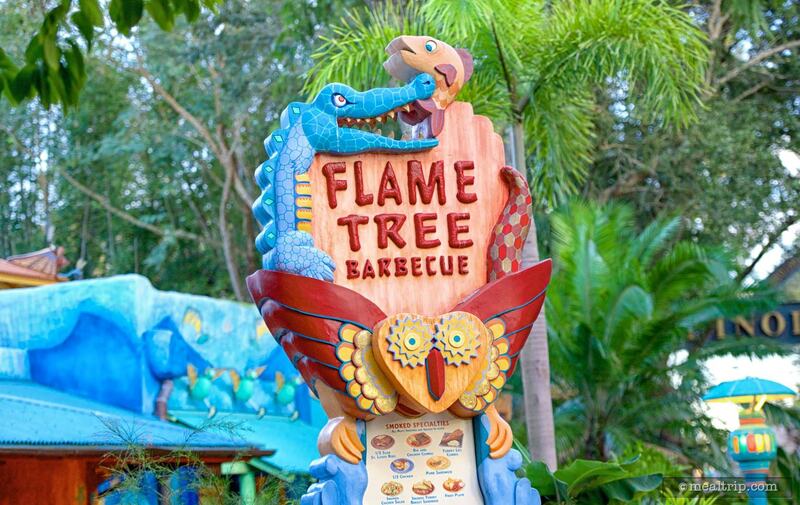 Flame Tree uses a special blend rub on the meats to achieve the “barbecue-ness”, and is a sauce-light (and in some cases, sauce-less) Barbeque. 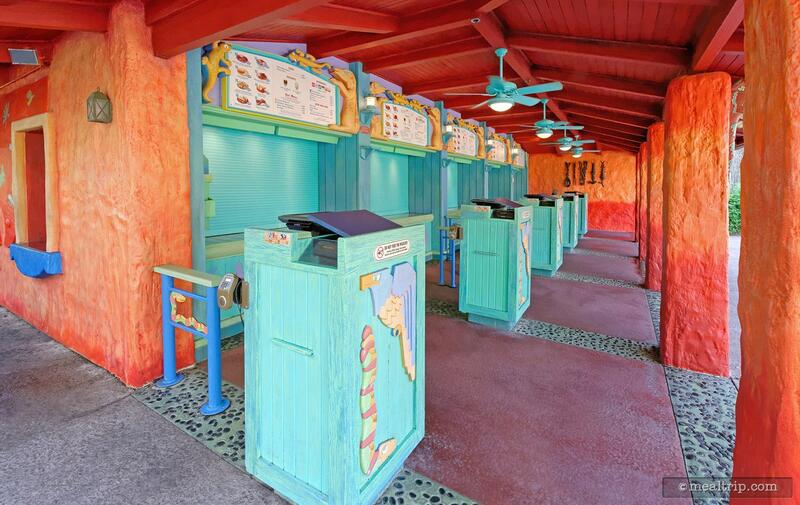 You can add your own Barbeque sauce (if you desire) from the condiment bar located in each of the covered seating areas. There are a couple of dessert cup offerings and in addition to the standard beverages, there are a few beers and wine available. 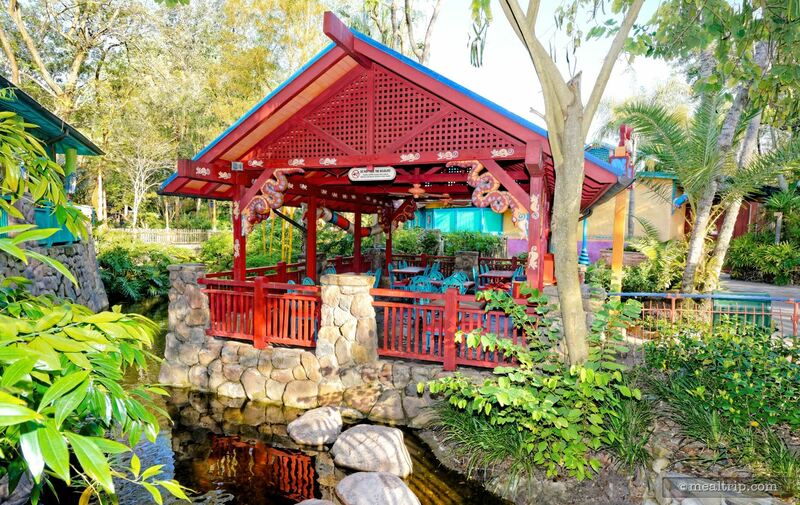 Flame Tree BBQ is a great place to stop in for some quick BBQ, as we did on a recent visit just after the holidays (but still during what Disney considers their "peak" holiday period). The good news... the onion rings are still the same spot-on, great, golden onion rings that I've come to expect from this location. 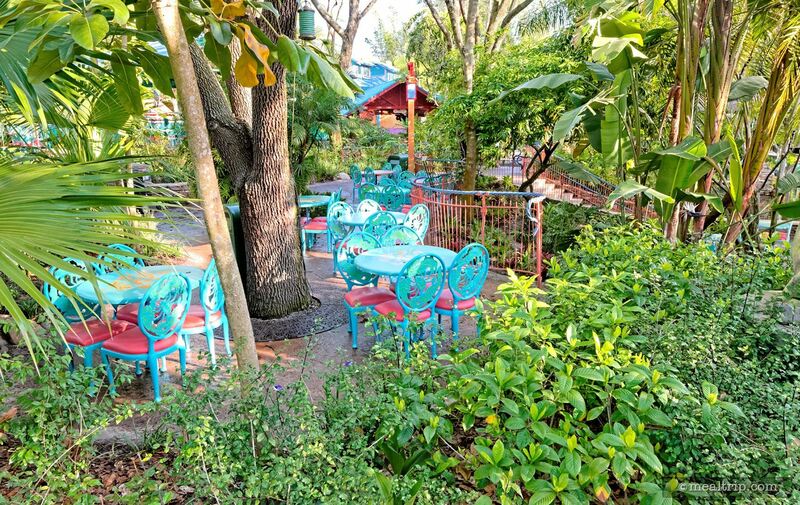 I haven't run into an onion ring from the Flame Tree BBQ that I didn't like. My main entree on this day was my old stand by, the pork sandwich with coleslaw. The coleslaw here has always been a little nondescript, but well chilled and never "bad" per-say. 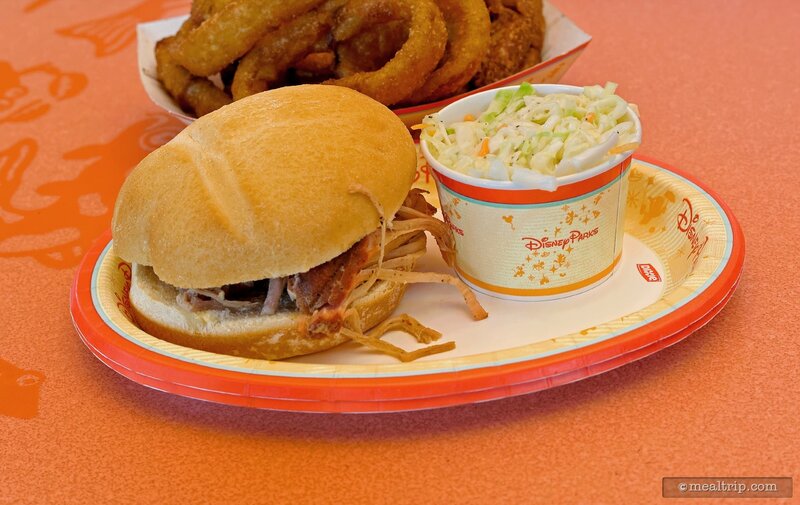 The pork sandwich at Flame Tree is a bit different than you would find at some other Disney locations (such as Pecos Bill's over at the Magic Kingdom). This one is a "dry" pulled pork, with the "BBQ" originating from a Flame Tree original spice rub that the meat is cooked in (so it's not swimming in red sauce when you get it). Usually, it's a quite delicious and a fair, hardy helping... but on this particular visit, the amount of pork in the bun was a little lacking. Perhaps it was because they were still in their "the park is packed with guests / holiday" mode... they were trying to ration things out a bit? That's not an excuse, but it might be the reason. The flavor was still great, but an extra bit of dryness might lead one to think it had spent a little too much time in a "keep warm" state, rather than being freshly pulled. 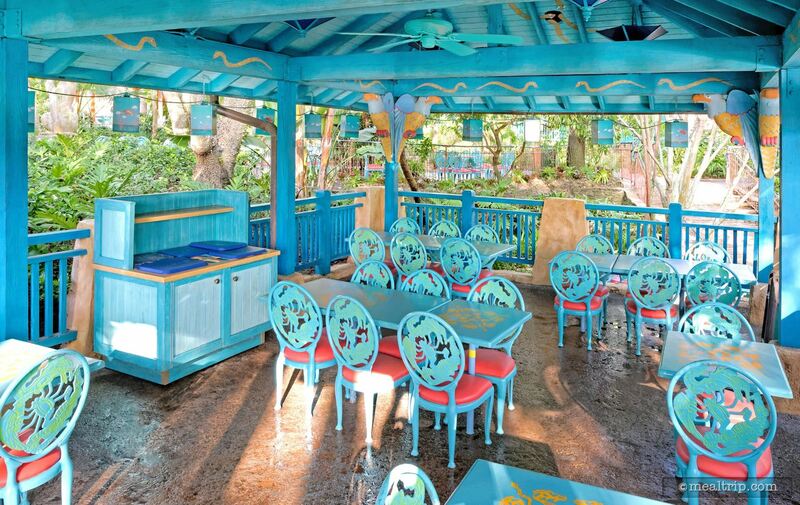 A bigger issue though, was the lack of cast members in the various dining areas. 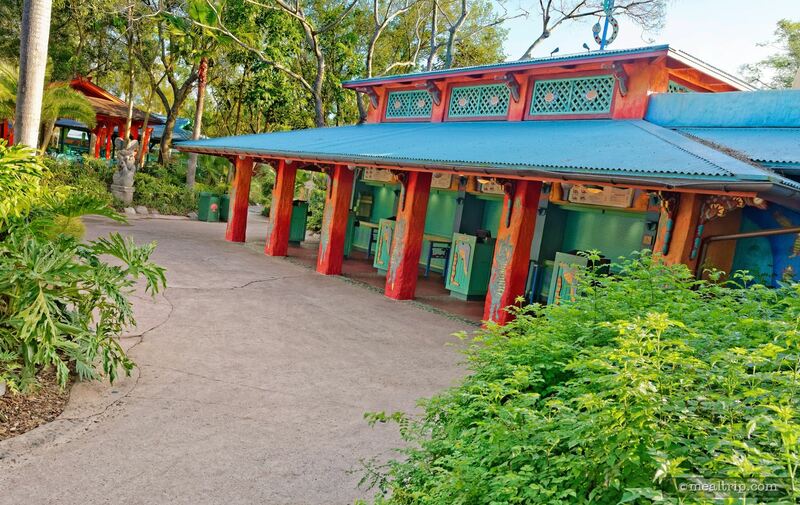 I have found, that when the Flame Tree is busy, the cast members are busy... and the place stays fairly clean (for an outdoor dining venue) and there's always somebody around to help you. On this particular visit, it was around 3:30pm, well past the lunch crowd, as there was ample seating available. In the particular paddock that we sat under, the BBQ sauce and Ketchup pumps were out of their oozy goodness... as in... completely dry. Now fortunately, the pork sandwich doesn't really "need" BBQ sauce, but it's nice knowing the option is there. On this visit, with the pork being a little "over", it would have been nice to have some. There were a few seating and area attendants far off in the distance, but not once in the half-hour that we were eating, did anyone set foot in our dinning area. Not to clean up after other guests, not to check the condiments bar... nothing. Which is a little disappointing. 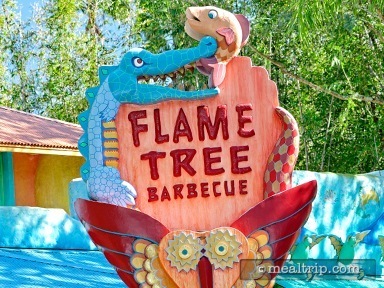 I have eaten at Flame Tree many times, so I am familiar with the food and the experience, and can file "unattentive attendants" off in the "maybe it will be better next time" column... but I wonder if the three other parties that were in our area might have wanted BBQ sauce or Ketchup? And if it was their first time at the restaurant, what kind of impression that left on them. The pork sandwich was dry. The BBQ sauce containers were empty in several locations yet employees were visiting amongst themselves. The onion rings were fantastic. 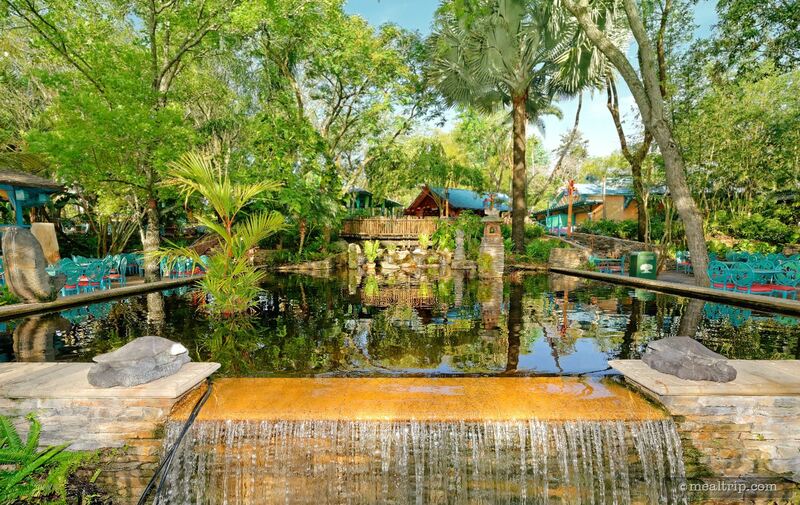 CLICK HERE to view all 10 images in our photo gallery. A few randomly selected photos from this location. (*) Price ranges listed are the average cost for one main entree and one soft beverage item, unless otherwise stated. There are many combinations of appetizers, deserts and drinks that will add to your final total. 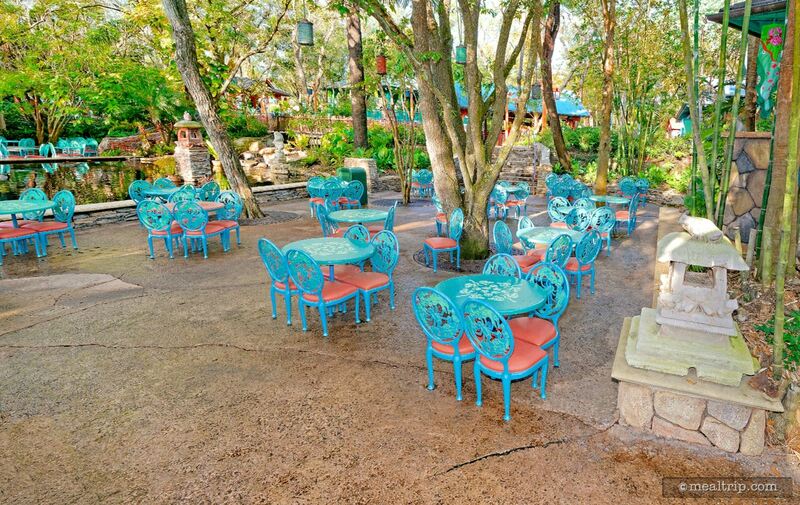 Many parks also use seasonal pricing systems which result in food and beverage costs increasing at peak times. Please check with the location that you are interested in for specific pricing information. All Contents ©2012-2019, Curtis Lawyer, All Rights Reserved. Mealtrip ©2012-2019, All Rights Reserved. Reproduction in whole or part in any form or medium without written permission is prohibited.